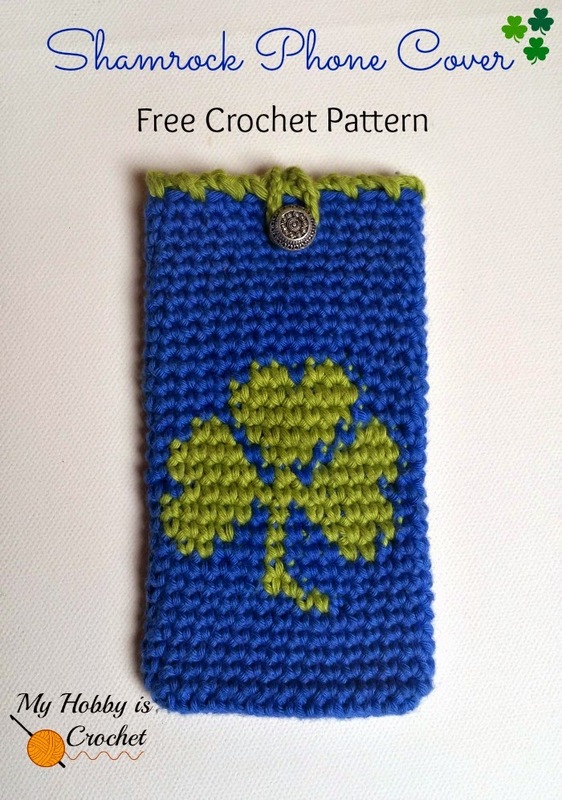 This Shamrock Phone Cover could be a good project to practice tapestry crochet. Make your own good luck charm! twsc: twisted single crochet: See my Tutorial! The phone cover is worked in spiral rounds, without joining at the end of each round. To keep track of where each round ends, slip a safety pin or stitch marker into the top of the last stitch of the round. With hook size 3.5 mm and MC chain 31. Being careful not to twist, join with sl st into round. 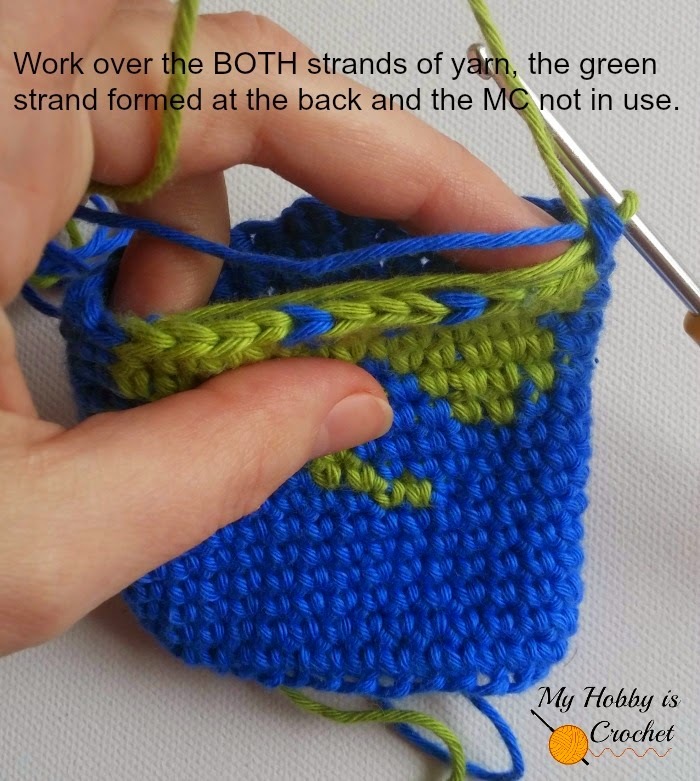 1) Color change: Colors are switched while 2 loops are still on the hook; yarn over with the new color and pull it through the loops of the last stitch before changing colors. 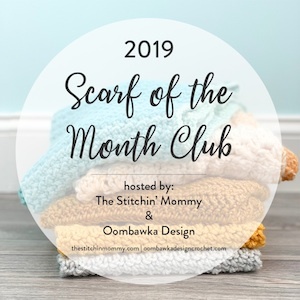 When you have one stitch only to work in a given color, work the stitch till half, having two loops on hook, yarn over and finish the stitch with the new color yarn. 2)Work OVER the unworked color yarn! Work the stitches tight, so that the unworked color don't sees through. Every once in a while, untwist the yarns. Beginning with round 10 till the end of the shamrock pattern you will start working with CC yarn bringing it from left to right as in the picture below (must be lying flat at the back of your work and don't shrink the crochet piece); start working with CC over the BOTH strands of yarn, the green strand formed at the back and the MC not in use, . The same when working with MC: work over both strands of CC at the back. Work OVER the unworked color yarn only for the shamrock pattern, do not work over the yarns at the back side. This means that in each next round after the last change from CC to MC you will leave the CC yarn hanging at the back and not working over it! 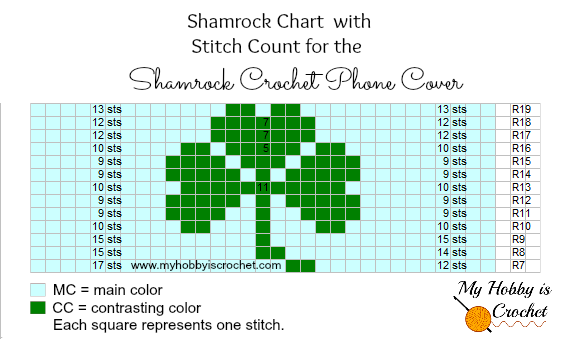 Turn the piece inside out and sew/ slip stitch together the 2 bottom sides, being careful that the shamrock is placed right in the middle of the front side. Turn the piece on the right side. Note: You will notice the slanting on the diagonal that occurs when working tapestry crochet with single crochet stitches. That's way the blue "line" between the top and right leaves it's interrupted. To correct this, I have stitched with a yarn needle over the green spots on the diagonal. But if you like, you can leave it as it is. Rounds 20 - 30: with MC continue working in spiral rounds sc in each st around. 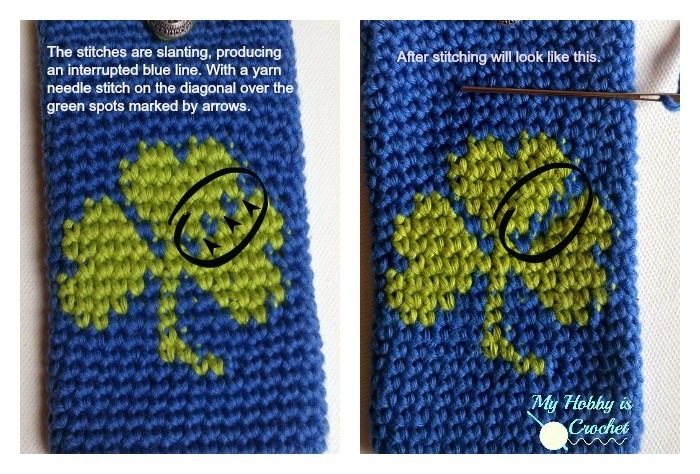 At the end of the round 30, if the front side is higher as the back side ( because in the shamrock pattern the stitches worked over the two strands of yarn are taller), try to even out the edge by working approx. 10 sc till the back left edge of the phone cover, then sl st to next st and fasten off. Button Loop: ch 14 (or as many to fit your button), sl st into same st. Cut yarn and fasten off. Sew on the button at the front.